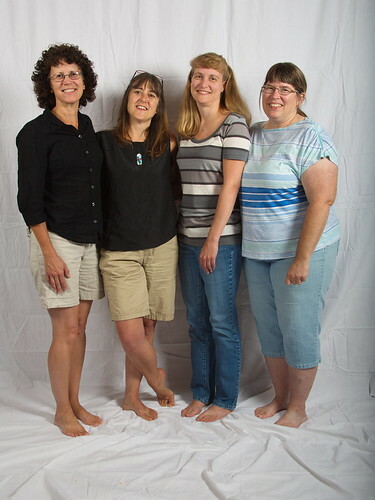 Four fine friends, a photo by The Bacher Family on Flickr. This was my first photo test with my new backdrop and studio light set. Yes, I definitely see room for improvement, and subsequent photo sets with the lights have turned out better than this one! Allow me to be self-critical for a minute: the lighting here is too even, too flat, and doesn't show definition in the facial features well enough. The subjects are standing too close to the backdrop, further adding to the flatness of the image and bringing every wrinkle in the backdrop into sharp focus. What I've learned since this photo (over the past month) is how to use my light meter to set the lights so that one is clearly the key light and the other is at least one and, better, two stops dimmer. I've gotten better at the placement of the two lights so that they sculpt the features rather than flattening them out. I've learned to keep some separation between the subjects and the backdrop. But yes, as amateur as the production is here -- or as unreasonably self-critical I am of my efforts -- you can't argue with the fact that these are four fine looking "young" ladies!